Last week, we put 1.00 mole of hydrogen gas into a cylinder. The resulting pressure was 243 kPa and the temperature was maintained steady at 20°C. This week, we’ll add 1.00 mol of helium gas, He(g), to the vessel and see what happens. Will the helium react with the hydrogen? No. Helium is completely inert. 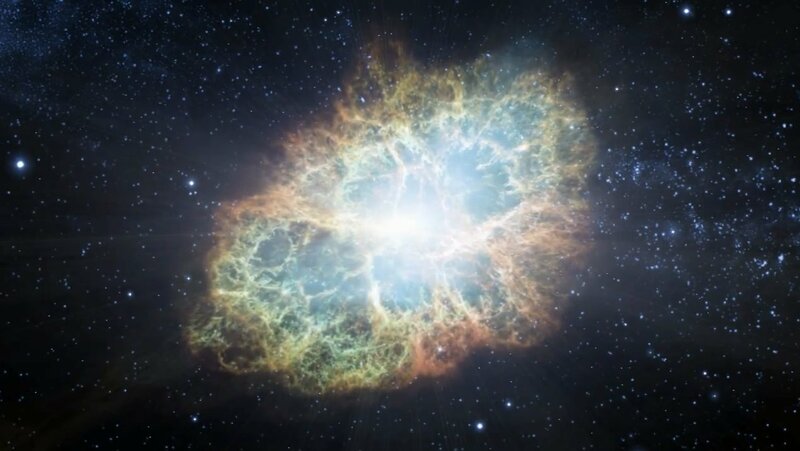 Hydrogen and helium will co-exist without undergoing any chemical reactions. What will the resulting pressure be? This is a very simple calculation. With 2.00 moles of gas in the vessel, the pressure would be double what it was before. This is known as Dalton’s law of partial pressures: the total pressure in a vessel is equal to the sum of all the pressure of the individual gases in the vessel. Let’s convert that into pounds per square inch (psi) for easy comparison with everyday objects. That’s about the same as a hard bicycle tyre. How fast are the molecules moving? Remember from last week that when our vessel contained only hydrogen gas, the molecules were moving around randomly with an average speed of 1760 metres per second. At constant temperature, heavier particles move more slowly than lighter ones. Even though they have the same kinetic energy, helium atoms at 20 °C move slower than hydrogen molecules at 20 °C because they have almost exactly double the mass. How much slower does the helium move? Let’s find out. The molecules are moving at 1245 metres per second, or 4482 km/h. This is slower than the hydrogen gas by a factor of exactly root 2. The molecules in our vessel could orbit the Earth in just 6 hours if they were to move in a single direction at this speed. Because the motion of particles in our gas mixture is random – they jiggle about rather than move in a single direction – they stay securely in the vessel. No chemistry’s happening in the vessel – not yet. Molecules of hydrogen and helium are simply co-existing in our vessel, bouncing off each other at different speeds and not interacting in any other way. For some chemistry to happen, we’ll need to add the next element, lithium. We’ll do that next week. I’m going to add 1.00 mol of hydrogen gas, H2(g), to our 10-litre vessel. We’ll assume that the entire experiment is carried out at normal room temperature – let’s say it’s 20°C. How much does a mole of hydrogen cost? Hydrogen gas is a relatively cheap element, and my one mole of H2(g) would cost less than one cent at wholesale prices. That said, the shipping, handling and service fee would be a couple of orders of magnitude greater than the cost of the gas itself, and I’d probably need to give the store about a dollar for the privilege of taking one cent’s worth of hydrogen gas. What does a mole of hydrogen look like? We’ll assume the temperature is 20°C and the atmospheric pressure is 102.3 kPa, which is what the Weather app on my phone is reading right now. After the hydrogen gas has been released from its high-pressure storage cylinder, my one mole of H2(g) would have a volume of 23.8 litres at these conditions. That’s about enough hydrogen gas to fill up a party balloon. Hydrogen is a colourless, odourless gas that’s lighter than air. It’d float upwards very quickly if I opened the valve in the store. I’m now going to squeeze all that gas into my 10-litre vessel. What’s the resulting pressure of the vessel? If I squeeze that 23.8 litres of hydrogen gas into my 10-litre vessel, the resulting pressure in the vessel must be greater than atmospheric pressure (1 atm) because I’ve compressed the gas. We can calculate the final pressure precisely by using the ideal gas law: PV=nRT. That’s significantly higher pressure than atmospheric pressure, which varies from 100 kPa to 102 kPa under normal weather conditions. Interestingly, the pressure in the vessel, 243 kPa, is equal to 35.2 pounds per square inch (psi), which is the same as the recommended pressure for a car tyre. Other than making random movements inside the vessel, the hydrogen molecules won’t really do anything else. How fast are the molecules moving about? The molecules are travelling at about 1760 metres per second (on average). How much distance will the gas molecules travel before they collide with one another? For this question, we need to calculate something called mean free path. The mean free path is the average distance we can expect each molecule to travel before it collides with another molecule. Mean free path is quite long in a vacuum, and very short at high pressure conditions. One of the formulae used to calculate mean free path, λ, is shown below. **Note that in this formula, pressure (P) must be measured in pascals (Pa)- not kilopascals (kPa). We therefore need to multiply our kilopascal pressure by 1000 to convert it from kPa to Pa.
*** Note also that d is the diameter of the molecules being studied in metres. Wikipedia tells us that hydrogen molecules have a diameter of 120 picometres. I’ve used this value in the equation below. The molecules in our vessel collide with each other roughly every 260 nanometres. That’s tiny: it’s just a few percent of the width of a cell nucleus! How often do the molecules collide? The molecules collide with each other roughly every 0.1478 nanoseconds. How many times do the molecules bump into each other each second? Each molecule in our ten-litre vessel makes 6.765 billion collisions per second with neighbouring molecules. Apart from lots of uneventful particle collisions – a total of 4.07 decillion uneventful collisions per second to be precise – not much else is happening in our ten-litre vessel at this stage. Next week, we’ll add some helium to the vessel and see what happens. RTQ! This is one of the most common sources of errors in Chemistry examinations. When I sat 2014’s VCE Chemistry examination, I lost 5 marks in the paper for not reading the question! Your teachers will have told you to ‘read the question’ or ‘RTQ’ as well. Task word errors can be avoided in two ways. First, learn the exact meanings of each task word. This is particularly important for EAL Chemistry students. Second, highlight the task words in a question (just as you would highlight the important information in a complicated titration question). In your answer, you will need to explain the effect of intermolecular forces. This means you’ll need to write why the butan-1-ol forms hydrogen bonds (due to the polar nature of the hydroxyl group) whereas butane forms only dispersion forces with its surrounding molecules (due to the non-polar nature of the molecule). You’ll also need to make some kind of comparison (which is hinted at by the word, ‘different’) in order to get all 3 marks. Example 3-mark answer: “Butan-1-ol forms intermolecular hydrogen bonds with the surrounding molecules due to the polar nature of the hydroxyl group (O-H bond). Butane forms only dispersion forces with its surrounding molecules due to the non-polar nature of the molecule. Hydrogen bonds are stronger than dispersion forces and thus require more energy to break. This results in a higher boiling point for butan-1-ol than for butane”. In a 1-mark answer, the student might only mention one of the two molecules, or might only make a comparison without explaining why these two compounds display different types of intermolecular forces. Example 1-mark answer: “Hydrogen bonds formed by butan-1-ol are stronger than dispersion forces formed by butane and thus require more energy to break. This results in a higher boiling point for butan-1-ol than for butane”. In that latter example, the student didn’t explain the reasons for the differences in intermolecular bonding – they merely stated them. To what extent 到什么程度 Write whether a reaction is complete (→) or incomplete (↔). Watch task words in the examination… and make sure you answer the question! Neil deGrasse Tyson’s Coming to Australia! Think Inc as officially announced Neil deGrasse Tyson’s 2015 Australian tour. Buy tickets to see Neil deGrasse Tyson at the Melbourne MCEC here. You might remember when I put Neil deGrasse Tyson’s viral video The Most Astounding Fact up on this website. I love that video because it communicates the importance of Science at a level deeper than any other. It’s a video I try to play to all my classes just once at an appropriate time in the year because it teaches what Tyson calls the Cosmic Perspective. I’m thrilled to say that Think Inc has announced this week that the legendary Neil deGrasse Tyson, passionate science communicator and Director of the Hayden Planetarium, is doing a four-stop tour of Australia including Melbourne, Brisbane, Sydney and Canberra from August 7th-23rd 2015. See the organisers’ official announcement here. Tyson is a world-famous astrophysicist and currently serves as director of the Hayden Planetarium in New York. He’s very popular on social media and recently hosted the hit TV series Cosmos, which had the biggest launch day in TV history (and featured a 30-second introduction speech by Barack Obama). I love Neil deGrasse Tyson’s videos because they inspire people to pursue Science. I show one or two Tyson videos to as many of my students as I can, usually at the beginning of the year. Happy New Year. The priority at this late stage is that you enter the examination hall well-rested, well-fed and with an appropriate level of stress. Wake up naturally. If you’re waking up too late, go to sleep at 7pm. Avoid backlit screens for one hour prior to sleeping. Backlit screens emit light in the 484-nanometre range, which excites melanopsin in the retinal ganglion cell photoreceptor. This disrupts your circadian rhythm and keeps you awake! Eat regular meals at regular times. Avoid exhausting sports around exam time (e.g. rugby). Do more walking, jogging, and lighter sports at exam time (e.g. badminton). Drink plenty of water(!) Aim to drink 3 litres per day. Research has shown that you perform difficult tasks (such as a Chemistry exam) much better under moderately relaxed conditions. The famous Yerkes-Dodson curve illustrates this beautifully. You want to be on top of that blue curve. More information about the Yerkes-Dodson curve. Light exercise will help you to position yourself at the tip of that blue curve, which will optimise your state of mind for learning as much as possible in the few days you’ve got left. Print plenty of practice exam papers and answer keys (ask your school for these). Spend 3½ hours doing the exam in semi-exam conditions. Keep it for next time: you’ll use the incorrect questions to guide your theory revision (step 6). Read and annotate the textbook chapters relating to questions you got wrong. DON’T READ YOUR NOTES. Read the textbook instead: it’s much clearer. Re-do those questions now you’ve learned the theory behind them. Follow steps 1-4 on How to use a Textbook: 6 Rules to Follow. This includes making vocabulary lists and beautiful, clear theory notes to go on your wall. Contact your teacher with any questions you have; exam content you don’t understand or worries you have about the exam. Talk to a friend if you’re stressed about the exam. Check out the resources below if your stress levels are still too high. This is the post where I divulge how I achieved an ATAR of over 99. I was in a government school at the time and didn’t have any home tutoring. So how did I do it? Follow these 8 rules to practice examination skills effectively and you’ll maximise your performance on examination day. To get enough spaced repetition for all the subjects you’re studying, you’ll need to study full time: that’s about 38 hours per week. This is about the same amount of time as you usually spend in school (7×50-minute lessons plus 2 hours of homework per night). You can fit 38 hours of revision comfortably into just 6 days of the week, leaving your Sundays completely free to relax and catch up on sleep. Start full-time revision several months before your big exams. This will train you to sit and focus for an entire examination. In 3.5 hours, you’ll have enough time to finish an examination paper and then mark it immediately afterwards. Research has shown that people recall more information when they’re in a similar physiological state to when they learned it: at the same time of day, and with similar hunger and stress levels. 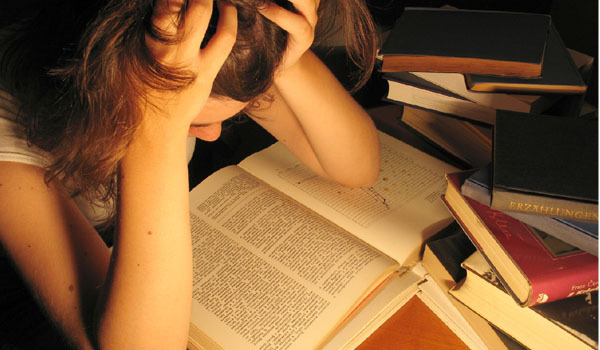 Try to revise for morning examinations in the morning, and afternoon examinations in the afternoon where possible. Get a giant wall calendar (minimum size is A3) from Officeworks and split each day into thirds. Each third represents one of the three study sessions mentioned above. Get coloured stickers from Officeworks and use them to label your examinations. Use a different colour for each subject. Working back from those examinations, put more stickers on the chart to denote which subjects you’ll study in each study session. Revise for no more than two sessions in a day. Take one day off each week. Use your free time to relax or get some exercise. 5. Revise in exam-like conditions! Disconnect from all social media until after your examinations have finished. Just leave one tweet/status update saying “Preparing for exams now full-time until November XXth. Wish me luck!” and delete all the social media apps from your phone. People will understand! Revise in a comfortable, clean, quiet, uncluttered room. (Some students in China rent hotel rooms at this time of year to help them revise more effectively!) Is your study place as clean and quiet as a hotel room? Revise sitting upright at a desk without a computer present. Don’t cross your legs. Use a desk that’s high enough, and sit 10cm from the edge of the desk. Remove all non-study-related objects from your desk and put them behind you. Don’t listen to music while revising. Not only will music distract you (no matter how much you insist otherwise! ), but it’s also forbidden in the examination hall. Eat and drink only things that are allowed in the examination while you’re revising. For the vast majority of people, that’s water only! In half of your revision sessions for each subject, do a past paper examination and mark the paper immediately after you’ve finished it. Circle any questions you didn’t get full marks on: you’ll use these as the basis for your next note-taking session for that subject (step 7). Use your textbook, your teacher and your Chemistry notes to correct any questions you answered incorrectly in your previous practice examination. Make detailed theory notes from the textbook on concepts you don’t fully understand and arrange them neatly on your wall. Make these notes colourful and large enough to be legible from a distance of 2 metres. Not only will this help you to get 100% in those topics next time, but a bedroom wall covered with succinct study notes also look really impressive to anyone else who sees them! If you start revising early enough, you’ll have time to make great theory notes from the entire textbook. Your bedroom wall should be plastered in study notes for all your subjects. Don’t revise on the morning before examinations. This will only make you feel rushed and more stressed in the morning. Use your time more wisely by making sure you get to school on time and instead. Don’t listen to music on examination days until after your examination is over! Songs stay in your head for a long time after you’ve heard them, and they’ll distract you slightly from the material you’re being tested on. Bring water in a transparent bottle into the examination hall. Wear layers of clothing that you can add/remove easily. The temperature in examination halls can be unpredictable. Always let invigilators know about errors in the examination paper. However, only tell them about the errors that might affect your score! Sticking to these 8 tips earned me excellent grades in school, and I believe that you can maximise your potential as well by following the same advice. Agree/disagree with any of these? Leave your comments below. Studies show that a student who leaves a class without having made any notes is able to recall about 10% of what was taught as they leave the classroom. Spaced repetition reviews with a home tutor can increase memory recall of knowledge being taught to well over 80%. By remembering more of the course content, students are primed with a foundation to understand and apply that knowledge much more easily. Tutors can also explain concepts much faster and more succinctly than teachers in the classroom because they’re working in a one-to-one environment. Without distractions, and without having to divide their attention between 20 or more students, a home tutor can explain clearly in ten minutes what might take a whole lesson if taught by a teacher in a classroom. Students who work on homework tasks with a home tutor tend to stay focussed for longer periods of time than those who don’t. With a home tutor, students can ask questions while doing their homework and spend less time getting ‘stuck’ because they get instant support when they need it. Home tutors can also question students and ask them to explain the answers they’ve given to check and consolidate understanding. A tutor can also break down even the most complex homework questions into a series of simpler questions that the student is able to complete. With home tutoring, students complete their homework assignments on-time and always to a very high standard. Imagine walking into a classroom already knowing the gist of what you’re about to learn. If a student learns a new topic with a home tutor, the classroom environment becomes the place for revision rather than first-time learning. Learning a complicated subject like VCE Chemistry is far more efficient this way. Probably the greatest benefit of pre-learning with a home tutor is that students can then make a great impression among their teachers and peers by grasping ‘new’ concepts extremely quickly in class, which gives them a huge confidence boost in the subject! Not all schools set enough homework tasks. You can ask your tutor for more homework questions. Unlike most classroom teachers, a home tutor knows your student’s exact strengths and weaknesses in the subject with great detail, and can select homework questions from a wider range of sources to help your student improve on the exact topic areas where they need more practice. In a VCE Chemistry examination, writing “the solution decolourises from blue to colourless” might earn one mark, whereas “the solution loses some of its colour” will not. Labelling ethanol in a combustion equation as “liquid (l)” might earn one mark, whereas “aqueous (aq)” will not. 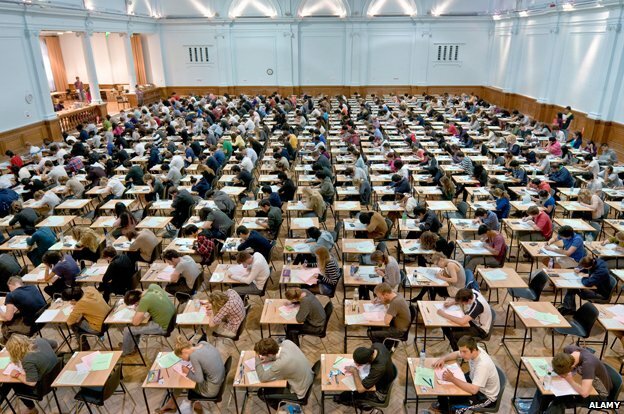 A classroom teacher marking dozens of tests can easily miss the subtle nuances of language that VCAA examiners are be looking for, or might not have the time to explain exactly why a question was answered incorrectly to each student in a class. Home tutors can examine, question and correct every answer the student gives—no matter whether it’s written or spoken—and provide instant feedback on the student’s responses as they work. Instant feedback is very motivating and time-saving for students. If the class is quite large, or if the teacher has a heavy accent, not all students will understand all of what the teacher is saying. Home tutors can explain the course concepts one-to-one in a quiet, home environment, which is efficient, engaging, and is always done in a way that the student understands. Home tutors always coach students from different schools. Hiring a home tutor allows you to gain access to a second set of textbooks, past paper examinations and practice materials from that teacher, which your current school might not have access to. The benefits of home tutoring allow the student to maximise their potential in homework, tests and examinations not only at VCE level, but throughout all the years of university as well. For as long as a student is sitting some kind of examinations, the student will be using above the strategies that a home tutor can provide. As a VCE Chemistry and Physics teacher, I can testify that students with regular home tutoring are generally happier and more focussed in class, pursue their homework tasks more thoroughly and gain higher scores in tests because they’ve had the one-to-one time required to learn all the subtle nuances in language that examiners are looking for. Find a tutor fast in Melbourne’s south-east suburbs. Leave me a message using the contact form below. The full moon above Australia will be “blood red” according to some reports as the moon enters the fringes of our Earth’s shadow called the penumbra tomorrow night. The Moon’s redness will be a result of the selective scattering of blue light by our atmosphere, which causes only the longest wavelengths (red) light to reach the edges of the Earth’s shadow (called the penumbra). Our huge, red Moon will pass through the penumbra as it orbits the Earth then become momentarily invisible as it traverses the centre of the Earth’s shadow (called the umbra). Melbourne is the perfect viewing spot for this spectacular eclipse. The reddened Moon will also appear extremely large (this is an optical illusion that results from the Moon being very low in the sky!). Time: Moonrise is at 7:21pm. Eclipse starts at 7:30pm and finishes at 11:30pm. RSC runs massive crystal-growing competition open to all students worldwide! Compete with thousands of other students from around the world by taking part in this epic crystal-growing experiment aimed at students aged 7-16, hosted by the Royal Society of Chemistry (RSC). Through getting your students involved in this year’s Global Experiment, you’ll be teaching them about dissolving, saturation and crystal growth. You’ll be engaging them in a fun, interactive science project they can easily continue at home. The RSC has even provided instruction packs, lesson plans and an instructional video to make the planning process as easy as possible for teachers. It’s free to take part, and no specialist equipment is required. It can be done entirely using a few cheap things purchased from a local store. It can be done at home, at school or at an after-school science club. The RSC has teamed up with the International Union of Crystallography to make this year’s Global Experiment officially a part of the International year of crystallography. The RSC’s Global Experiment has been a great success in recent years. It follows the 2013 Global Experiment: measuring the quantity of vitamin C in fruits and vegetables, and the 2012 Global Experiment: Chemistry in the Olympics. For more information, or to register, go to http://www.rsc.org/learn-chemistry/collections/online-experimentation/collaborative-chemistry/global-experiment-2014, and check out some existing entries on their Pinterest board. I saw a Greenpeace advertisement recently that lambasted LEGO® for its ongoing toy deals with Shell Corporation. The advertisement was dark, sarcastic, and tasteless. The video, made to highlight the Danish company’s $130-million relationship with Shell, has reappeared on YouTube after being withdrawn last week following copyright complaints from the toy-maker. The video made me feel sorry for LEGO®. 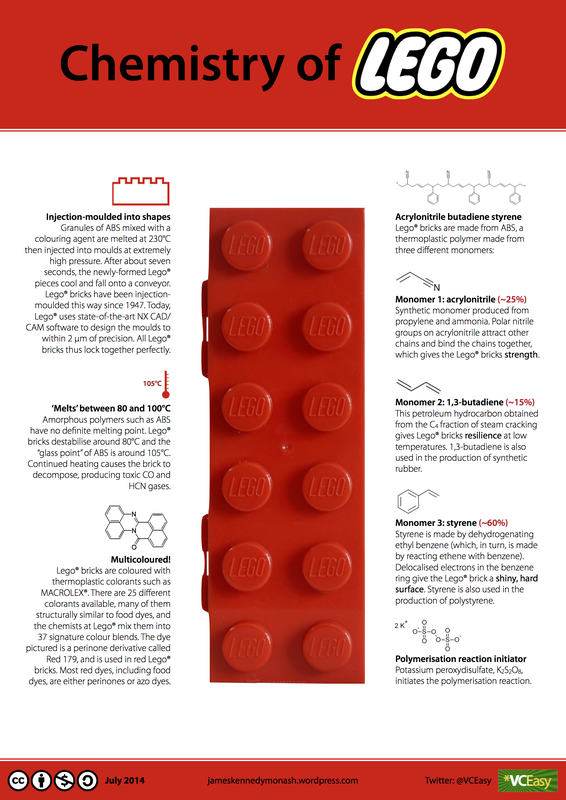 It also reminded me that LEGO® is made from oil-based products (even though they’re trying to find a sustainable alternative), and it inspired me to make this infographic: the Chemistry of everyone’s favourite building block. LEGO® is made from ABS (acrylonitrile butadiene styrene), a thermoplastic polymer comprised of three monomers. The first monomer, acrylonitrile, gives the bricks strength. The second, 1,3-butadiene, gives them resilience (i.e. stops them from snapping so easily) and the third, styrene, gives them a shiny, hard surface. These three ingredients are mixed with colorants then polymerised (hardened) with the help of an initiator called potassium peroxydisulphate. LEGO® buys pre-made ABS granules and injects them into brick shapes on a massive scale. LEGO® make 20 billion bricks each year (that’s 35,000 bricks a minute) and according to the Guinness Book of World Records, they produce more plastic tyres than anyone else. Personally, I think that’s a remarkable feat. It’s engineering genius. Why is Gold yellow? Special relativity causes length contractions and time dilations in objects that travel at speeds approaching the speed of light. 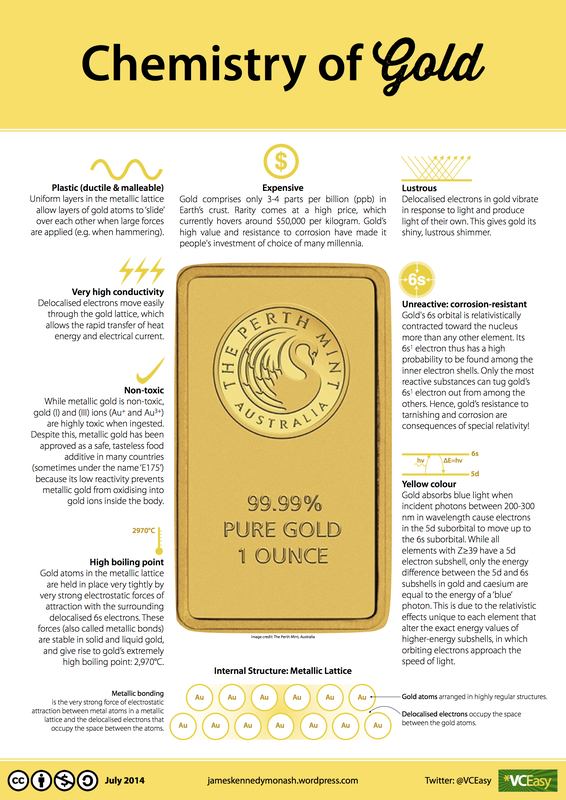 The valence electrons of large atoms such as gold have such high energies that their speeds actually approach the speed of light—and the relativistic effects on those electrons can become quite large. Special relativity changes the energy levels of the 5d orbital in a gold atom so that the energy difference between 5d and 6s orbitals equals the energy of a ‘blue’ photon. Gold thus absorbs blue light when electrons are elevated from the 5d to the 6s orbitals, while other metals do not. These special relativistic changes to the energy levels of atomic orbitals are slightly different for each element. If you’re in high school, you should spend about two thirds of each day studying for six days each week for several months before your important exams. But apart from doing the required homework, what else should you be doing in that time? Make them, re-make them and then make them again. Make them clearer and more beautiful every time. Organise them according to the official study design (or “syllabus”) for your course. Put your notes on the wall of your bedroom or study. Take some of them down temporarily and see if you can recall them by heart. You can buy books of theory notes online, but the process of making your own notes is when most of the theory learning actually takes place. Use those purchased books for inspiration only. It’s okay to use a computer to make notes, but do at least one hand-written version as well. Become a pro at hand-writing explanations and sketching diagrams with a pen. This experience will save you time in the exam. (2) Do lots of practice questions. Get practice questions from as many sources as you can. Use real past papers, use past-paper-style questions from companies, and if you need more, do questions from the textbooks your school isn’t using. Complete these questions first without answers, then refer to your theory notes if you get stuck. When done (or if completely stuck), check the answer key or send an email to your teacher. Do all of this in one study session. That’s almost all there is to it! I’ll post more about each of these two instructions in the next two weeks. Making great notes and doing lots of practice questions are the two most important parts of exam revision. Questions? Contact me. Need VCE theory notes? Go to VCEasy.org. Ingredients of an All-Natural Banana went viral back in January 2014 and attracted over 2 million views on various websites worldwide. The posters and t-shirts are now available in 7 different languages. My favourite contribution overall has to be this one (below). it’s simple and artistic and states a very strong message. It’s part of an educational series by Sense About Science, and you can download their groundbreaking report from their website here. You can’t lead a chemical-free life. Natural isn’t always good for you and man-made chemicals are not inherently dangerous. Synthetic chemicals are not causing many cancers and other diseases. 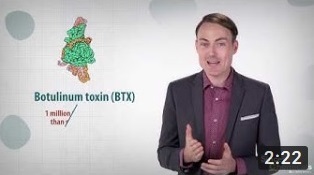 ‘Detox’ is a marketing myth. We are not just subjects in an unregulated, uncontrolled environment, there are checks in place. The VCEasy Visual VCE booklets are designed to give students a concise, visual summary of all the essential knowledge for their VCE course—with nothing superfluous added, and nothing taken away. Just 100% VCE notes. The design is highly visual, and each page corresponds to one Key Knowledge Point taken directly from the VCAA Study Design. More information (including free downloads) are available here.